New Delhi : Land issues are apparently delaying the much awaited project to set up second All India Institute of Medical Science (AIIMS) in Bihar which had been scheduled to set up in Darbhanga. The reasoning appears lack of finalisation of the land. In 2015-16, the project of setting up second AIIMS in the state was proposed in Union Budget. The centre had asked the state to find more alternative locations of 200 acre land along with requisite infrastructure. “For the moment, it is the state’s responsibility to find an alternative land. All the other AIIMS, as promised by the government, are approved. Only the one in Darbhanga is pending. The state may find another place in the same district or in any other district as per their choice,” the official further added. The first AIIMS in the state is based in Patna which was established in 2012 which works autonomously under the Ministry of Health and Family Welfare. Six new AIIMS have already been made open to provide public service which are based in Bhopal (Madhya Pradesh), Bhubaneswar (Odisha), Jodhpur (Rajasthan), Patna (Bihar), Raipur (Chhattisgarh) and Rishikesh (Uttarakhand). Medical dialogues team earlier reported that Union Cabinet chaired by Prime Minister Narendra Modi gave approval for setting three AIIMS, including two in Jammu and Kashmir, and one in Gujarat. Apart from these projects, the government has also given its nod for setting up AIIMS in Rae Bareli (U.P. ), Nagpur (Maharashtra), Kalyani (West Bengal) and Mangalagiri in Guntur (A.P. ), Gorakhpur (U.P. ), Bathinda (Punjab), Guwahati (Assam), Bilaspur (Himachal Pradesh), Madurai (Tamil Nadu), Bibi Nagar (Telangana) and Deoghar (Jharkhand). Why can\’t the govt focus on improving primary, secondary health care? Creating behemoths like AIIMS at this stage will not help. The earlier 6 new \’so called\’ AIIMS have not made any earth shaking contribution to our healthcare system. The scarce resources should be judiciously expended rather than making political statements. TO TALK ABOUT MAN POWER , IT LOOKS IT IS BETTER TO BE JOBLESS YOUTH EVEN AT 50 YEARS. BEING A JOBLESS YOUTH ONE CAN HAVE BETTER OPERTUNITIES TO A LAWMAKERS , STARING FROM M L A , M P, MINISTER , EVEN TO BE A HEAD OF THE PARTY AND C M OR PM IN WAITING. WE HAVE / HAD QUITE LOT DOCTORS WHO HAVE BECOME LAWMAKERS IN KAR NATAKA . SAME MAY TRUE IN OTHER STATES ALSO. RECENTLY A BABU WAS IN NEWS TO BE JOBLESS (QUITTING THE JOB ) TO BE A LAWMAKER OF A MOST DISTURBED STATE OF INDIA. Even the one they have is grossly undermanned. So why throw more good money after bad. What we always forget the Institution depends on the manpower within. WHAT A CONTRACT , WHEN IT COMES TO ESTABLISH NEW MEDICAL COLLEGES , THE SAME GOVERNMENT HAS FIXED 30 ACRES OF LAND . 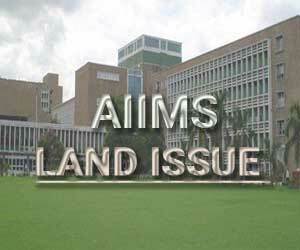 WHEN IT COMES TO AIIMS, THEY ARE LOOKING FOR 200 ACRES OF LAND ( 6 TIMES MORE THAN THE REQUIREMENT). ONE MORE FUNNY THING , THEY ARE STRUGGLING TO PROCURE 200 ACRES OF LAND THAT IN A SMALL TOWN / CITY IN BIHAR , HAVING SAME NDA GOVERNMENTS IN BOTH STATE & CENTRE. WHAT KIND OF COUNTRY WE ARE LIVING ? WHAT KIND OF GOVERNANCE IS THIS ? IS IT A OF SHAME OR ACT OF PRIDE OR THE WAY TO EXPOSE THE STUPIDITY ???. COMON GROW UP , DON\’T TRY TO BE STUPID . JUST START THE WORK EVEN WITH 50 TO 100 ACRES OF LAND , OVER THE TIME , YOU COLLECT AS MUCH LAND AS REQUIRED. ( LEARN FROM MR ROBERT ,HOW TO GET LAND FROM HARYANA, HIMACHAL PRADESH AND RAJASTHAN EFFORTLESSLY . DON\’T FORGET TO THANK ME FOR GIVING YOU WONDERFUL IDEAS THAT TOO FREE OF COST.